Your kitchen, much like your living or family room, is a multipurpose space, where you cook, clean, eat, and much more. The kids may use the kitchen island as their homework spot, and you may have friends over for coffee during those summer mornings. It’s important to design your kitchen lighting with each task in mind, while also considering how the space functions as a whole. You want the lights to reflect the design of the room, and accentuate its best features. You’ve most likely heard of the “work triangle” that exists between the refrigerator, sink, and stove/oven in your kitchen. While this is mostly an aspect of the design/architecture of your kitchen, it also plays a part in your lighting. 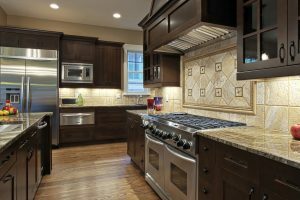 You’ll want to be sure to have proper lighting above your sink as you’re prepping or cleaning, and enough light around the stove and oven to see as you’re cooking. Your island may also be a part of this “triangle,” since that may be where you serve and eat most meals. Recessed lights above the sink will help you see better, under cabinet lights are ideal for the stove area, and pendant lights will make your island more functional and inviting. If you’re shopping for new kitchen lighting in Chicago, come to Hortons Home Lighting today. We have locations in La Grange, Chicago, and Orland Park, and the lighting experts at each showroom will gladly help you find the ideal lights for your kitchen. We look forward to helping you!